Honeydew includes 20 powerful new stories, including familiar places and entirely new settings. In prose as knowing as it is poetic, Pearlman shines a light on small, devastatingly precise moments to reflect the beauty and grace found in everyday life. 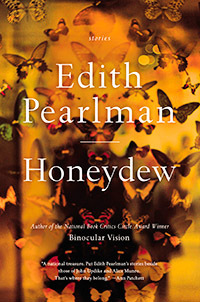 Both for its artistry and for the recognizable lives of the characters it renders so exquisitely and compassionately, Honeydew is a collection that will pull readers back time and again. These stories are a crowning achievement for a brilliant career and demonstrate once more that Pearlman is a master of the form whose vision is unfailingly wise and forgiving. This Yefgin—what a rogue! Leather battle jacket, cascading Rs, and a circlet of gray hair lying loose on his head just as if it were a wig, though whenever he bent his two-timing face to examine a piece of jewelry, Rennie saw that it was real hair springing from his pink scalp. Double deception! And then, that peculiar profession—in a brown third-floor office Yefgin cured people of addictions like tobacco and scratch tickets, using a combination of hypnosis and harangue. “Special concoction,” he said, with a wink. Many of his clients did quit their habits, though they often switched to new ones. When Yefgin addressed a woman he kissed her hand first, then twisted his face into a grin that suggested he’d just conceived a helpless passion for her even though they’d met only minutes ago, such things happened all the time in Turgenev. His discolored teeth inspired sympathy rather than revulsion. He was forever in debt. Rennie let his IOUs accumulate to a thousand dollars—then, until he paid up, she refused to sell him any of the dramatic prewar brooches and bracelets he bought for his mistress, and she wouldn’t sell him any delicate Victorian rings either, the ones he gave to his wife, Vera. Oh, the scamp. From time to time Yefgin brought Vera into Forget Me Not to try on one of those rings. She was a large woman with dyed hair whose garnet eyes were settled comfortably in her fleshy face. Rings meant for the fourth finger had trouble wriggling past the knuckle of her pinkie. They had to be resized. Yefgin doted on his fat spouse. He doted on his mistress too, buying her an enamel cockatoo and a bracelet of gold panels connected by diamonds—and, today, right now, a bouquet of amethysts for her lapel. “Don’t tell Vera,” Yefgin said, scribbling his IOU. He needn’t have troubled to say anything: Rennie made it a point of honor to keep her customers’ business to herself. Yefgin kissed her hand and scooted away.